A letter to myself, 2025 (2030?! ): if you become a professor, don’t sell out Native students. If microaggressions occur in your classroom, don’t ignore them and assume students haven’t noted this complicity as consent. If microaggressions occur in an institutional setting (say, a departmental gathering) and your students are present, challenge it. They are watching. Precarity in academia is a hot topic, but sometimes in a way that upholds academic hierarchies and dishonestly represent the privileged as powerless. As a professor, you have so much power. Even when you think you don’t. Even as an Indigenous professor, woman, or professor of color. (tenured white male profs: your level of privilege & power is off the charts here, FYI). You are the front lines of defense for marginalized undergraduate students, particularly young Indigenous women and LGBTQ students, who desperately need your support. Even when you think it’s not enough. Even when you’re afraid. There is a growing discussion about the exploitation of graduate students, but little that I’ve seen examining the position of Indigenous undergraduates in the Canadian universities. As a result of great organizing, there is now a graduate students union at my university. Undergraduate students, even those of us who TA/RA, aren’t covered. Undergrads are still viewed as the “kids” of the university, assumed to be entirely uninterested in and unaffected by the systematic workings of the space around us. Matter-of-fact, casual comments about undergraduates as the ‘cash cow’ of the university abound, even in progressive circles. But, the worlds of Indigenous undergrad students are much more complex than that. Since we are still relatively so few in number, many of us end up taking on institutional roles as undergraduates in addition to our degree requirements. We are immersed in institutional politics, often as a matter of survival. When I say “we”, ie. “those of us in the academy”, characterizing myself as an “academic” or “scholar”, it belies the fact that my position as an undergraduate student, regardless of my accomplishments or intellect, of the spaces I occupy and the relationships I cultivate, I still exist in a sort of academic limbo. I’m still not a professional academic, nor is there any 100% guarantee at this point that I will 1) complete my undergrad, 2) be accepted into a graduate program, 3) complete the program, 4) be accepted into a doctoral program, 5) complete the program, 6) get a job. The academic respectability temptation of tenure is not even a consideration at this point. To put it bluntly, as a Native undergrad, I’m a barnacle clinging to the side of the Titanic. Yet, we are not entirely powerless. During my undergraduate degree, I have been what Sara Ahmed characterizes as a “problem student”. Because of survival, but also because of willfulness. My power is this: as an undergrad, I can raise a considerable amount of hell about institutional discrimination, and I don’t have to worry about my department head or dean reprimanding me; at least not in the sense of worrying about losing my job and income source. An example of this is my ongoing dissent to an Indigenous philosophy course at my university taught by a white professor with no background in the topic. Undercutting prolific Indigenous Studies dept while unqualified white profs teach Indigenous Philosophy. That’s “indigenizing the academy”. There are still very tangible risks in being an outspoken Indigenous undergraduate student. After confronting institutional racism, I still have to return to classrooms. They mark my work. They monitor me and have the discretionary power to decide whether or not they think I’m a “contributing” member of the classroom. Especially in fields like philosophy and political studies, this is never objective. When I walk into a classroom on the first day, professors in my department know my name and usually demonstrate awareness of my reputation on campus. At the very least, they can see that I am a brown-skinned young woman. Professors often make it clear to me that they are aware of my activism (and that they agree or disagree); that they have read my writing or a news story about me. This is often done by subtle or not-so-subtle comments in classrooms, at department events, through word of mouth. Academia is a small world, disciplines even smaller. The professors teaching in my discipline now may be administrators when it is time for me to apply for doctoral programs and jobs. My writing and social media presence as an activist will be examined when it is time for me to apply for doctoral programs and jobs. I do not have an advisor. No one is responsible for me. I do not have professors to advocate for me except for those who choose to do it out of kindness, friendship, or sense of duty. It goes beyond the university: our activism is monitored by the Canadian government. While I value the experiences I’ve had with the inner workings of academia, I am also frustrated that I was never afforded the undergraduate experience of my non-Native peers. One does not simply focus on writing an essay while trying to challenge the professor on the racist essay topic. Canadian educational institutions are, naturally, invested in the propagation of Canadian colonialism and imperialism. As Sarah Ahmed writes, the success or failure of the university’s ideological project is “located in the bodies of students”. Students who dissent are punished swiftly, usually via marking us as disobedient, which leads to our “disappearance” (I’ll come back to this). We’re left to hope that apathetic settler profs or overworked Native profs will have time to advocate for us when we challenge the violence of the classroom. While feeling split apart by these structures, something that gives me a bit of safety is my ability to write and tweet, and scream until I get some form of justice, to create my own record of events. In the grand scheme of things, my blog and my twitter aren’t much – but it’s one of the most effective self-determined modes of resistance I can reliably access. That, and the support and guidance of scholars who have “made it” to where I hope to be. And so, it breaks my heart every time I deal with an administrator or professor who seems more invested in protecting their tenure or position than protecting Native students from violent institutions. To paraphrase a mentor, Kyle: What can the settler academy do to us as Indigenous academics? Where can they put us that is any worse, any more oppressive than the places most of us have been at some point in our lives? At that moment, the door burst open. It was the Grade 8 teacher. He said “Oh. Sorry. I didn’t know anyone was in here.” It took me a few years to realize that yes, of course, he had seen the principal take me into that supply closet. And he chose to intervene. Shortly after this incident, I walked out and never went back to that school. They never called to see if I would return. I wonder, for how many Native students, at one point or another in our education, this is the case. I wonder how much worse it might’ve been if the teacher hadn’t made a split-second decision to act. The disappearance of Indigenous students from classrooms, much like the disappearance of Indigenous communities from the land, is not only convenient, but necessary for the maintenance of settler colonial states like Canada. And much like the latter, the former is explained away as a product of the inherent inferiority of Indigenous minds, bodies, and cultures, rather than the result of a colonial system that violently displaces us. What’s the solution to this? It can no longer be an attempt to “indigenize” institutional schooling based on colonial hierarchies. No more trying to fit Indigenous students into these spaces to the detriment of our learning and wellbeing. As disheartened as I am when those I view as colleagues and mentors fail to speak up, there are many examples of times when senior academics (or at least those more senior than me) have shown me that professional scholarship is not achieved only at the price of conformity and complicity. Professors who dare to speak out – some prominent examples being Steven Salaita with the University of Illinois, and currently at UBC, Jennifer Berdahl – are example cases of the vitriol faced by professors for taking their fields of study seriously and living their work as critical words, action, policy. However, they are also examples of the type of public support that can be mobilized when a professor speaks out about institutional injustice. 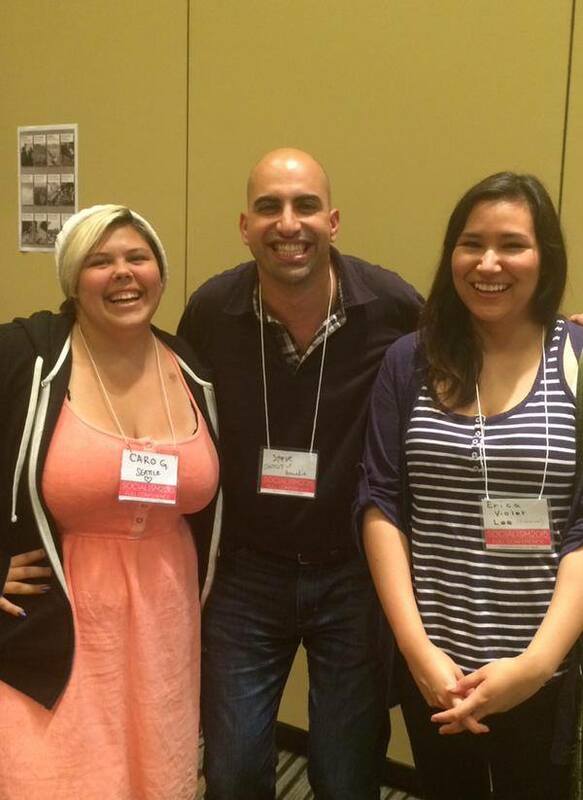 I had a chance to hear Steven Salaita speak at Socialism 2015 this summer, and although I knew his story, it was so refreshing to hear such a well-known academic call tenured professors out on their complacency within the system. After the talk, I asked Steven if quoting him on Twitter was okay, he laughed and said “Oh, of course!”, echoing the “what else are they going to do to me?” sentiment. chillin’ with Steve & Caro at Socialism 2015, feeling validated in my hellraising. As my friend and mentor, Zoe (a newly minted Métis professor) said, “I shout to stay alive”. As a Native feminist student in the historically white, historically male discipline of philosophy, there is little protection in place for me when I choose to take on institutional discrimination. Formal complaints filed with an academic institution are just as effective as internally-run investigations into police brutality. It is precisely in my shouting that I have any power and influence. Our silence will never, ever protect us. But more than that, our silence will never liberate us. The colonial academic industrial complex will never dismantle itself, and it will never change if scholars are afraid to challenge it. It will continue to tokenize and reward the complicit while exploiting Indigenous scholars, starting with the most vulnerable – students. But we won’t all go down without a fight. After all, what more can they do to us? Audre Lorde. “The Transformation of Silence into Language and Action.” Sister Outsider: Essays and Speeches by Audre Lorde. I would have Loved to stay in “School” but money was a problem. My Professor told me that he was learning more from me than I was learning from him and that School was a waste of time for me because I was too Educated already. It was a good year. Ovide Mercredi will never forget his Visit to Malaspina U/C. I organised a takeover of the Students Union by Voting. The Malaspina Native Students ended up with a Native Studies Degree Program and the Students Union Building got built by the Students I taught Activism 101 to shortly after I left. Don’t be intimidated by students like I was nurture them like Dr Eugene Attleo & Dr. Melody Martin nurtured me. It affected more than just me. Reblogged this on Unsettling America. Great article. I am not Native, but as a minority coming from a formerly colonized region, I feel your sentiments. As a university student myself in Canada, I too am disturbed at the function of the academia. I actually decided to not go into graduate studies because I realized I would inevitably have to conform to institutionalized hegemonic norms. I am a Metis professor, my PHD is in philosophy and I can empathize with everything you said. I teach Indigenous philosophy but I in a Native Studies department. Thanks Lorraine, it’s really special that you took the time to respond. I admire your work. Reblogged this on Postcolonial Perspectives.